South Korea will purchase four units of Airbus’ in-flight refueling tankers by 2019 to help boost the country’s air defense, officials said Tuesday, marking the first introduction of European warplane here in more than 20 years. The National Defense Acquisition Program Committee picked the winner of the 1.49 trillion won ($1.34 billion) project at a session presided over by Defense Minister Han Min-koo. The France-headquartered company is expected to deliver two tankers in 2018 and another two the following year. The A330 MRTT beat two other competitors ― Boeing’s KC-46 and Israel Aerospace Industries’ B767 MMTT ― though the competition was seen as a two-horse race between the European and U.S. aerospace giants, which had the upper hand than their Israeli challenger, whose tanker is based on a secondhand 767 platform originally built by Boeing. “Airbus’ A330 MRTT has excellent performance in terms of the duration of flight in far-field zones, the amount of fuel that can be offloaded air-to-air, the passenger and cargo transport capacity, while earning high scores for its price,” Defense Acquisition Program Administration spokesperson Kim Si-cheol said at a news conference. It will be South Korea’s first purchase of European military aircraft in 21 years. Seoul brought in 12 CN-235 transporters from Spain in 1994 and 20 advanced trainer jets from Britain in 1992. The announcement will open the door for the introduction of more European weapons systems in a market dominated by U.S. military equipment. According to the annual Global Defense Trade Report of the research institute IHS, South Korea was the world’s seventh-largest importer of defense equipment in 2014. However, nearly 80 percent of the country’s imports came from the U.S. The Air Force here has sought to acquire refueling aircraft since 1993 as its existing fighters can operate for up to only 30 minutes over the most remote areas of its territory, including Dokdo, its easternmost islets claimed by Japan. With the deployment of the A330 MRTT, they may fly up to Pyongyang and nearby regions in North Korea, Kim said. “It will also enhance our combat effectiveness and facilitate our peacekeeping operations and emergency relief efforts overseas by enabling long-distance, mass supplies,” he added. The decision, initially slated for late last year, was delayed due to drawn-out negotiations with the bidders and their failure to meet the requirements set by Seoul as part of offset agreements, which typically entail technology transfer and other support programs. 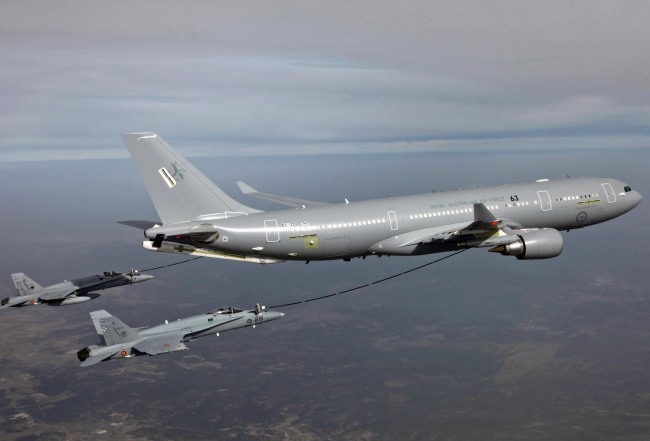 The A330 MRTT has an edge in rearming and passenger transport capabilities as it can carry 111 tons of fuel and 266 passengers, compared with the KC-46’s 96.1 tons of fuel and 114 passengers. The Airbus model boasts the ability to conduct various missions including air-to-air refueling, the transport of passengers and military servicemen, and aerial medical evacuations. Another crucial factor was the production stage. More than 20 units of the A330 MRTT are currently in deployment, whereas the development of the KC-46 is to be completed in 2017. The U.K., Australia, the United Arab Emirates, Saudi Arabia, Singapore and France have decided to purchase the Airbus product. As the KC-46 is a military derivative of the 767 jet, Boeing had highlighted the significance of its interoperability with the U.S. Air Force, which itself plans to procure 179 KC-46s by 2027. Alarmed by a recent string of corruption scandals involving procurement deals, Kim noted that the assessment process was carried out by 19 military officials, scholars and other experts in the fairest possible fashion.